The EcoTEC Plus 48kW System Gas Boiler is a lightweight and compact condensing unit that has been designed and manufactured by Vaillant. This highly reliable boiler is highly efficient and comes with an efficiency rating of 93% which means that it has an ErP A rating. It’s available with an output rating of 48kW which is the perfect size for large homes with multiple bathrooms that have a higher demand for heating and hot water. With other outputs available, including 46kW and 65kW, this range of boilers can suit homes of many sizes. It can also be fuelled with natural gas or LPG. One big advantage of this System boiler is that it can be placed just about anywhere and it can be installed in cascade to provide a flexible and extremely efficient heating system. The boiler features a gas valve to automatically optimise heat and hot water supply, a stainless steel heat exchanger which protects the boiler from oxidation and corrosion, the boiler also has a pump as well as integrated connection for expansion vessels which allows for easy installation that helps to save you time and money. You’ll also have maximum performance during the cold winter months thanks to built-in two stage frost protection. 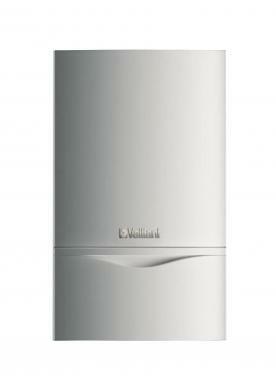 The boiler has a fully modulating low NOx burner which helps to achieve lower emissions. The unit has easy access to all components from the front along with a single electronic circuit board and flue gas analysis point, making repairs and service easier than ever. The boiler comes equipped with an air separator with auto air vent and filter to remove fine particles and also has an intelligent eBUS control including weather compensators, multiple boiler management control system to ensure your system is reliable and easy to run no matter what. Installation is also simple with thanks to a push fit flue system making it simple to installed. As a System boiler, this unit sends hot water to the radiators and a sealed hot water storage cylinder. The vital components are built into the boiler itself, helping to make it more compact and easier to service than a Regular boiler. It also comes with a 5 year warranty for peace of mind after the installation.